Obituary for Mike Oleski | Westlock Funeral Home & Crematorium Ltd. It is with great sorrow that the family of Mike Oleski announces his passing on November 22, 2018, at the age of 84 at the Youville Home in St Albert. 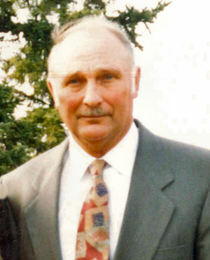 Mike will be dearly remembered by his son, Darryl; his brother, James (Eleanor); and sisters, Cassie, Mary and Victoria (Melvin); his partner Adeline; his sister-in-law, Nadie; his grandchildren, Ellyn and Ross; his many beloved nieces and nephews; and the many dear friends he made throughout the years. Mike was predeceased by his son, Jason; parents, Alex and Mary; and his brother, John; brother-in-law's, Wesley and Jim. The family wishes to express their sincere gratitude to the staff at The Youville Home in St. Albert for their wonderful, dedicated care and compassion during Mike’s stay there. A Memorial Service will be held on Wednesday, November 28th, 2018 at 11:00 a.m. at the Westlock Funeral Home. In lieu of flowers and/or cards, donations can be made in Mike’s name to the Alzheimer’s Society.